Longtime hockey fans likely recall some special New Year’s memories. In recent times, those memories might have to do with the annual World Junior hockey tournament, or perhaps an outdoors NHL game, like the Red Wings/Leafs clash at the University of Michigan stadium from two or three years ago. For me, two games stand out that fit into the “New Year” theme, and both occurred on December 31st. The first dates back to (and I’m estimating here) December of 1965. Our family lived across the border from Detroit, in a very small town outside of Windsor, Ontario. So on occasion, my Dad would take me to a game at the old Detroit Olympia. Usually, we went to see the Habs (Dad’s team) or my Leafs. But on this night, my Dad asked if I wanted to go to see the Blackhawks take on Detroit. My Dad never seemed to plan these outings—it was always a spur of the moment thing. 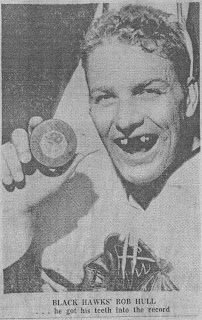 Chicago superstar Bobby Hull was the biggest name in the sport at the time, and I had never seen him “live” before, so I was keen to make the trek across the Ambassador Bridge. The building was jam packed, even though it was New Year’s Eve. We ended up with standing room tickets. I wasn’t very tall at the best of times, but I was doing all I could to get up next to the railing/barrier/glass behind the “end zone” (far behind the nets) lower bowl seats. It was a great experience as an 11 or 12 year-old (depending on whether it was 1965 or 1966) to feel the pulse of that great old hockey building. Red Wing fans were rabid and very, very loud, especially when Gordie Howe (revered in Detroit) touched the puck. We were expecting a lot of action from two really good offensive teams but it was actually, in the end, a somewhat dullish game—at least from what I could see from my standing room perch. (Side note: you couldn’t leave your spot for any reason throughout the entire game, because if you did, the spot would be long gone by the time you got back…) The final score, if I remember correctly, was 1-1. Hull (seen in an early '60s photo at right after he scored 50 goals in a season for the first time) didn’t do anything out of the ordinary. I seem to recall that he was “shadowed” all night by the Red Wings' best agitator, Bryan “Bugsy” Watson. Nonetheless, it was pretty neat to be at the game. And we still had time to get back across the border to attend the traditional family New Year’s eve festivities at my aunt and uncle’s house. My other New Year’s memory also occurred on December 31. Many old-time VLM readers will remember fondly the classic New Year’s eve matchup between the Montreal Canadiens and the Russian Central Red Army squad in 1975. Red Army was in the midst of a North American tour (as was their Russian league counterpart, the Soviet Wings). The Montreal-Red Army clash was a wonderful display of hockey—skating, hitting and goaltending. It was hockey at pretty much its finest, at least for me. Intense, fast, with almost non-stop energy from both teams. The Montreal Forum crowd was always passionate, but on this night, it seemed (on television, at least) the hometown support was at another level. Montreal netminder Kenny Dryden (left) struggled that night, allowing 3 goals on maybe 15 shots. Vladislav Tretiak was strong at the other end. 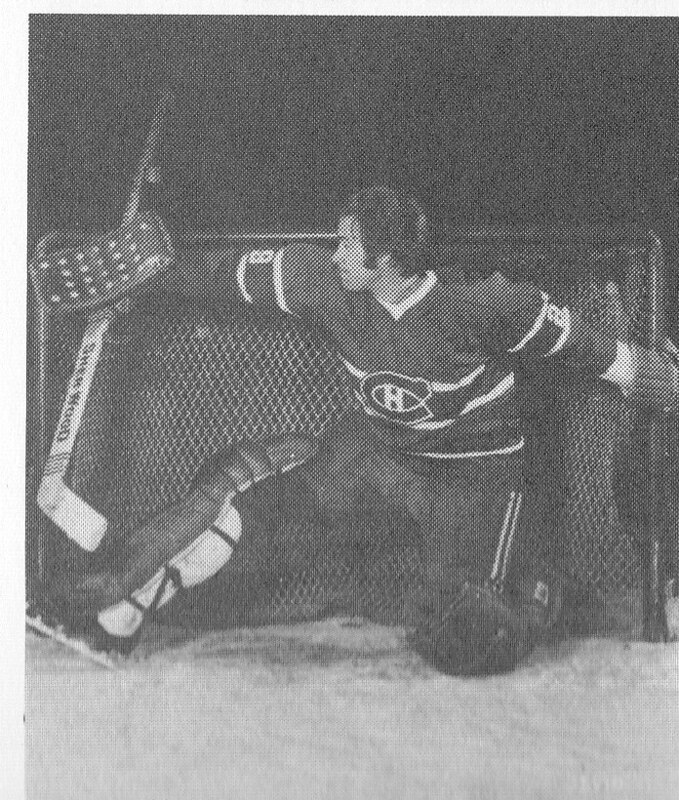 I don’t remember how many shots Montreal took, but the Habs carried the play all night and Tretiak had to be solid to keep his team in the game. Normally, “exhibition” games don’t mean much, but a lot of people, at least at the time, thought it was one of the finest games they had ever see. Coming a few short years after the famous 1972 Summitt Series, the mid-season game carried real meaning in the never-ending debate about whether Canada or Russian had the world’s best players. The game did nothing to decide that argument, but it sure was great hockey. I wasn’t there in person, but with the legendary Danny Gallivan calling the play-by-play on television, it had the feel of a Stanley Cup deciding game. That matchup seemed to mean a great deal to the players as well. Guys like Yvan Cournoyer (Montreal’s captain at the time) and Larry Robinson were outstanding but everyone played well for the Habs that night. In the end, the Red Army made their shots count and the game ended in a tie. (For the record, as good as Valeri Kharlamov was for the Russian National team and Red Army, I have long been of the view that the best all-around Russian player in those days was Alexander Yakushev. He was a strong, smart, rugged and skilled player. But I’d happily have taken either on our Leaf teams of that era… we already had elite players like Salming, Sittler, Turnbull and McDonald. Looking back, those are a couple of games that stand out for me. If you have any New Year’s hockey memories, I look forward to hearing from you. Guess I am from the same era as you, I just turned 64 last week. That 1975 New Years Eve game is also my favourite. My dad had a cottage on Mississippi Lake and we had a New Year's Eve party there. Drank a few and watched the game then went snowmobiling on the lake which seemed like a good idea at the time but I wouldn't want my son doing it now because it was cold back then and now we have the green house warming. We did know the lake pretty well and knew where not to go. That was a great game all skill and speed. The Flyers beat Red Army a few days later which I thought was great at the time but thinking about it now it really proved nothing as the Flyers intimidated a Russian team which had never experienced that type hockey. I have the same thoughts now when I think about Scott Stevens nailing Eric Lindros in the head. It pretty much ended his career and it should not be allowed to happen in today's game. I watched the World Juniors and was really looking forward to seeing Nylander and he gets concussed in the first game, I just hope it doesn't happen again but I am already worried as now they are saying every brain injury is cumulative and each new concussion adds to the damage. Anyway the Leafs were starting to look good and then got smoked 7-0 tonight - I turned over to the Sens at 3-0, glad I did. I was all for the Leafs finishing last overall - Austin Mathhews - then they started to win a few and they had me hoping they would make the playoffs. The Duck game was the best I have seen this year and my hopes were rising, LA was a good game they could have won but they were smoked 7-0 tonight. Guess they should just stick with the plan, they have some really good prospects and a high lottery pick this year is going to help more than making the playoffs and a quick exit. I'm just hoping the Pens make the playoffs around 16th - if the Pens miss this year and next year Leafs lose the 1st round pick for Kessel which becomes a 2nd. That Kessel deal doesn't seem as bad as it originally looked - Kessel has done nothing and Kapenen looked good in the Juniors. The Leaf loss in San Jose may well have been a 'one off' at the end of a gruelling western road trip. If so, that game will be forgotten as the team continues to surprise.